Hand made English pewter birth certificate holder. Two designs available, rabbits or teddy bears. Simply put the childs birth certificate into the tube and it can be kept safe and displayed. Hand made pewter box for holding that memorible moment. 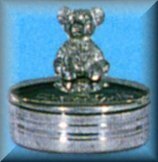 Hand made pewter birth plate with scroll clock and teddy bear image. 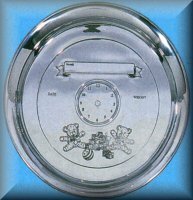 This plate can be engraved with the childs name, date of birth, time of birth and weight of your baby. Hand made pewter birth tankards. 3 designs available, Clock, Stork handle and ABC. Each tankard can be engraved with the name of your baby, date of birth, time of birth and weight of your baby.